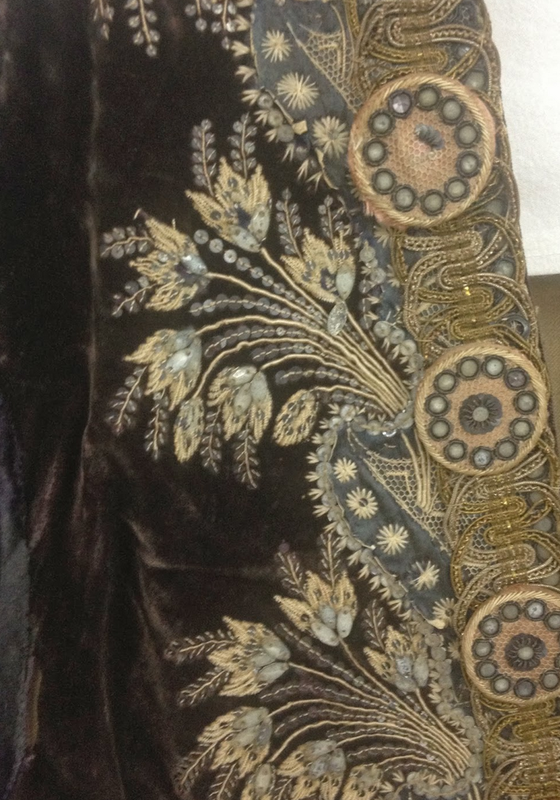 It's no secret that I have a weakness for the beautifully embroidered gentleman's coats of the late 18th c. (see past blogs here and here.) The design and workmanship in these garments are unrivaled – even the buttons can be little masterpieces – and they also mark the last gasp of the male peacock before the somber fabrics and tailoring of the 19th c. come in to favor, and remain so today. In fact any gathering of Western male politicians or world leaders shows a sober group indeed, uniformly clad in dark suits and white shirts; American presidents get away with red ties and navy suits in the name of patriotism. But it wasn't always so, as the coat shown here demonstrates. Now in the collection of the Museum of London, this coat was worn by William Pitt the Younger (1759-1806.) Pitt was one of Britain's most famous and most successful prime ministers. 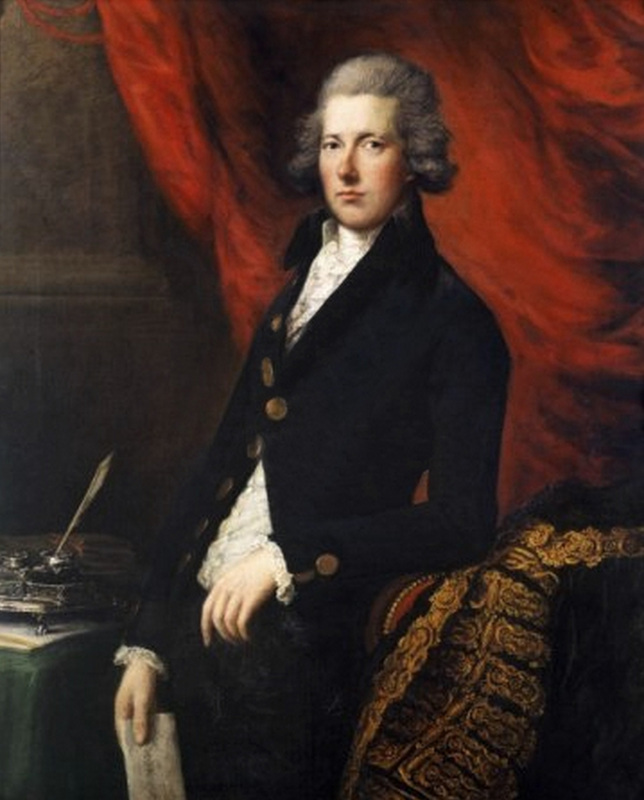 Having become the country's youngest Prime Minster at the tender age of 24, he skillfully guided Britain through two ministries and some of its most tumultuous history in an era that included the French Revolution, the Napoleonic Wars, a national economy that was evolving with the Industrial Revolution, and a king – George III – who was subject to fits of madness. While Pitt was known for his intellectual brilliance, he was not a flamboyant individual. His portrait, lower left, shows a gentleman already embracing the severe new fashions. But when it came to dressing to attend His Majesty's Court, he chose this coat, with a matching waistcoat and breeches. 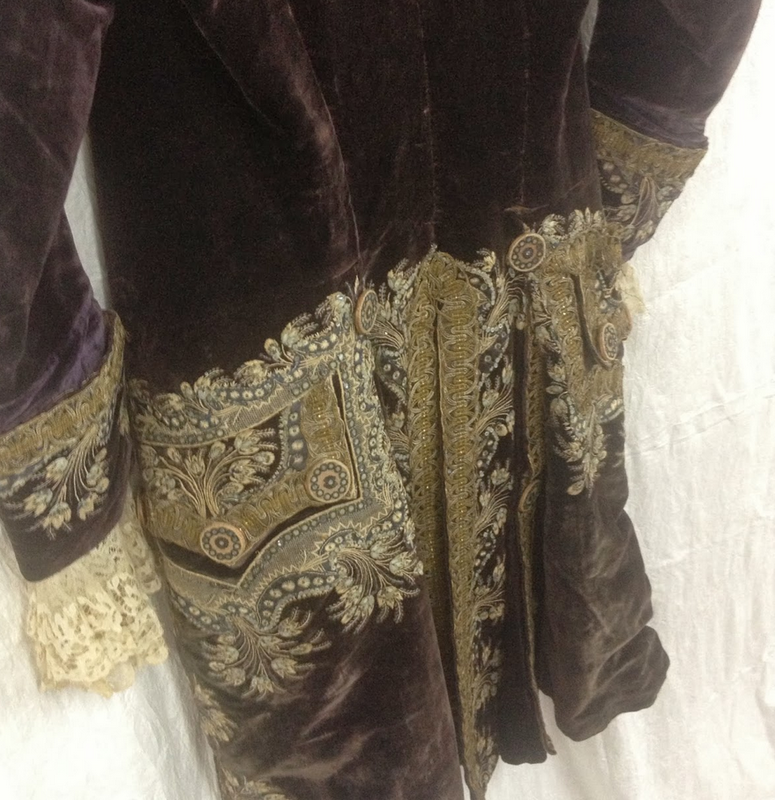 Made of once-brilliant purple silk velvet, the coat has suffered grievously over the centuries, including a stint as a theatrical costume during the 19th c. (Oh, the sad ruin to so much 18th c. clothing, caused by the Victorian love of fancy dress!) Threads have popped and sequins have been lost, the velvet has faded and grown rumpled, and those strange lace cuffs must have been added to please some now-forgotten leading man. But there's still enough of the coat remaining to glimpse its former splendor, and to imagine it being worn by the Prime Minister to a candle-lit, glittering affair at the palace. For more information and photographs of this coat, please visit The Private Life of William Pitt, an excellent blog devoted to the Prime Minister's life. Written by social historian & researcher Stephenie Woolterton, the blog is one of my personal favs for insight into the late Georgian political scene. Above right: Details, Frock Coat Worn by William Pitt the Younger, c. 1790s, Museum of London. Photographs by Stephenie Woolerton. Lower left: William Pitt the Younger, by Gainsborough Dupont, 1787. Burrell Collection. Pitt liked a drink. My favourite story of him is about the time someone in the House of Commons said "Mr. Pitt likes his bottle of port" - and got the indignant retort, "Two bottles, Sir." Think he was a seven-bottle-a-day man, wasn't he? Nice frock! I really enjoyed seeing this coat and reading about it. I had never heard of Pit, but I gather he was a man who liked his coats and bottles! Thank you for this article and for recommending the Pitt website. Most interesting. There's no doubt that Pitt the Younger did have a rare genius for running a government, but I fear I'll always imagine him as portrayed by the bloodless Benedict Cumberbatch in AMAZING GRACE, forever mooning after Wilberforce. I, too, love the late Georgian look of his frock coat. Boo on the Beau. However, his star was not to last; however, he did cast men into dreariness. Anyway, a bit ago (I don't recall if it was here? ), older portraits of some very famous men were updated by computer wizardry. However, I will only have MY Admiral Nelson in the original 18th century version. I would never leave my mules under the 20th century version's bed ;-).